Emerald Shire, an area of 10,364 sq km, and generally 250 km west of Rockhampton, was amalgamated with three other shires in 2008 to form Central Highlands Regional Council. The shire and its administrative centre, Emerald, were named after the Emerald Downs pastoral station (1866). The township was surveyed in 1878, a year in anticipation of the westerly extension of the railway line from Rockhampton. The area was administered as part of the Belyando local government division (1880), then the Peak Downs division (1884) and finally as a division in its own right in 1902. The following year it became a shire. European settlement clustered along the east-west railway line and Capricorn Highway, from Comet to Emerald and the Anakie Gemfields towns of Sapphire and Rubyvale. 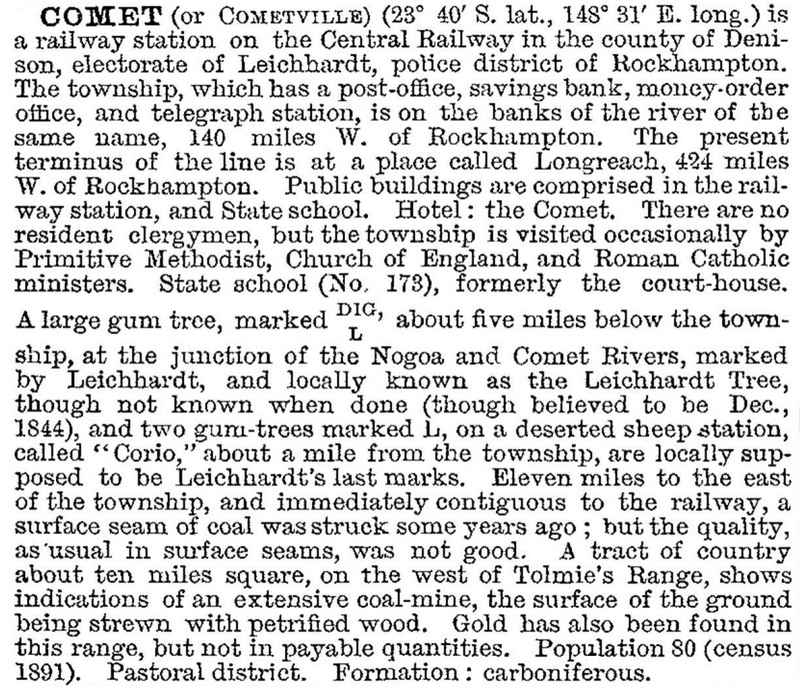 Comet and Emerald townships (1878-79) preceded the gemfields towns by 25 years, and Emerald emerged as the main town when branch lines to Clermont and Springsure were opened in 1884 and 1887. Pastoralism founded Emerald, and it dominated agriculture for the first 80 years. Cereals, cotton and citrus were also grown, and a State experimental farm (1898-1932) at Gindie, south of Emerald, grew numerous crops, including sorghum, maize and pumpkins. Locust attacks affected nine of the farm's crop years. Light prickly pear infestation, and severe infestation at Comet, held back development during the 1920s-30s. 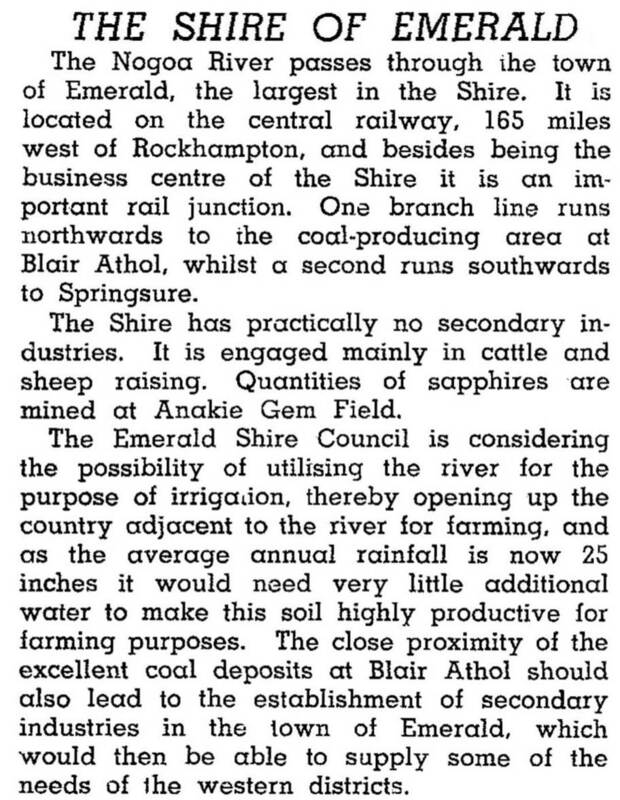 In 1940 the Queensland British Food Corporation began an ambitious farming venture in the shire, but a variety of climatic misfortunes ended the project in 1955. By then, though, State irrigation had begun with the Selma Weir on the Nogoa River and plans were afoot for the Fairbairn Dam/Lake Maraboon project further downstream. Named after David Fairbairn, Minister for National Development, the dam had an on-site construction town of 642 people (1971). With a capacity of 1.44 million megalitres, irrigation flows began in 1972. At least 120 irrigation farms on 22,000 ha were developed by 1984, of which about one-third produced cotton. A ginnery, transferred from Ord River, Western Australia, began operation in 1979, and a second one at Yamala in 1988. Fairbairn has assisted flood mitigation, produced a fair water yield from a catchment of variable rainfall, but caused some soil erosion and salinity problems. Its water is also used for coal processing at Blackwater, Saraji, etc, and for hydro-electric generation. Coinciding with the development of irrigated farming, coal mining began north-east of Emerald. The Gregory open cut mine (1979), although in Peak Downs Shire, used Emerald as its permanent dormitory town. A coal railway was opened in 1980, and another opened in 1992 when the Gordonstone underground mine began. There is also gem and sapphire mining about 40 km west of Emerald at Anakie, Rubyvale, Sapphire and The Willows.